There have been 411,434 cards generated since April 19, 2011. 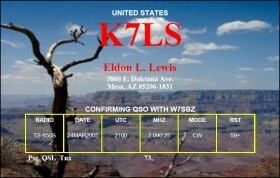 You can use this web page to create QSL cards. The cards will be created in the form of a PDF document that you can then print on light-weight card stock. The individual cards can then be cut out and the information filled in and mailed to the intended recipient. You have the option of printing a single QSL card or printing up to four cards per page. The cards are printed 5.5 inches wide by 3.5 inches high. 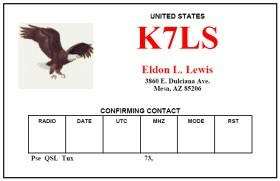 This is a standard size for a QSL card. However, this leaves no room for margins when printing over two cards per page on a standard 8.5 by 11 paper size. Fortunately, since these are pdf files you can print them and have the page print with the fit to page option. This will slightly reduce the size of the cards and allow them to be printed on whatever printer that you have. This will allow you to make better use of any special paper you are using, assuming you don't mind having the cards slightly smaller than is normal. You will need the free Adobe Acrobat Reader to view the pdf QSL Cards. If you would like to have your card be a little more personal, you can select an image on your computer and have it used when creating the QSL cards. If you would like to do this then please select the image that you would like to use by clicking on the "browse" button. You have the option of printing the image as a background or else having it printed next to your address. You also have the option to have the ARRL logo printed next to your address. You will simply need to specify, on the image, address and ARRL logo whether you want it printed left, center or on the right side of the card. There is also a "MISC" field that you can use to print any information that the QSL Card Creator doesn't allow for by default. This is useful if you have information that you want printed that wasn't thought of when the card creator was being designed. The "MISC" field will print just below the address. Please be aware that this feature may not work if the image you are trying to use is too large. If you get an error or the QSL card is not created as expected, try reducing the size of the image and see if that solves the problem for you. Also, if you get tired of reentering your name and address and other information, you can create a free user account and/or login to this site and once logged in most of the information used when creating the QSL card will be saved and used the next time you want to create one. You can display the optional data on all cards or on the first card only. Display Image as card background or next to	address? Question: What absorbs the energy from light falling on a photovoltaic cell?